Her blue eyes match the silk of her dress. She has flung her shawl on her chair and turned to gaze at the viewer. You can’t help but stare right back at her. The Countess of Haussonville, the great French beauty of her day, has arrived. Nearly 200 years after she was painted by the French artist, Jean-Auguste-Dominique Ingres, Louise-Albertine, Princess of Broglie and Countess of Haussonville, has come back to Europe. She is just one of 36 objects being lent to The Hague by The Frick Collection in New York, its largest ever loan. As the exhibition opened on 5 February at the Mauritshuis, the queues snaked around the block. These artworks are the legacy of the industrialist Henry Clay Frick, whose collection occupies his former home in a Beaux-arts mansion on the Upper East Side of Manhattan. A place of pilgrimage for art lovers, it’s famous not only for the quality of its holdings but also because it never lends. Under the terms of the bequest, nothing acquired in the founder’s lifetime has ever left New York. So the only way to appreciate Holbein’s portraits of Sir Thomas More and Thomas Cromwell is to part with $20 and enter the hall where these two sworn enemies glower at each other from either side of the fireplace. Indeed the Mauritshuis can boast not one but two paintings which have become wildly famous. It owns The Goldfinch, painted by Fabritius in 1654, the subject of a 2013 Pulitzer prize-winning novel by Donna Tartt. Meanwhile the popularity of the Vermeer portrait has soared since Tracy Chevalier’s novel of 1999, Girl With a Pearl Earring, became a successful film in 2003 starring Colin Firth as the painter and Scarlett Johansson as the eponymous heroine. Still, neither poster girl will have to fight it out: serving girl and Countess will hang in separate rooms. 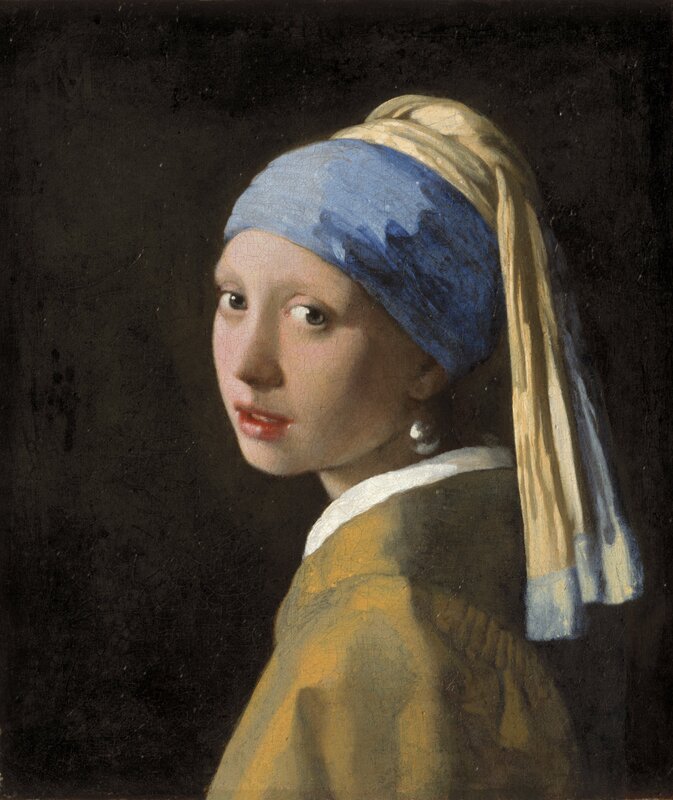 Unlike the Ingres, almost nothing is known about the Vermeer. Thought to date from c. 1665, it was bought at auction in 1881 for two guilders (under £40 at today’s prices) by a collector with a hunch. He had the picture cleaned . . . and the rest is art history. The Countess, however, is a different story. 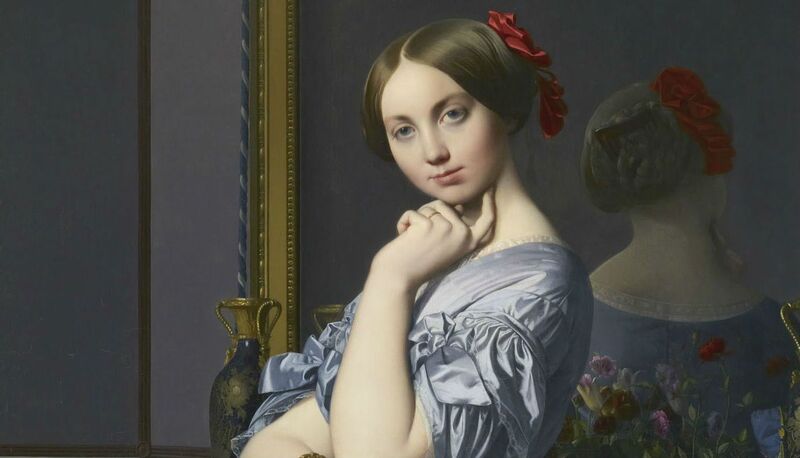 Painted by Ingres in 1845, Louise-Albertine came from a grand political family, renowned for her beauty and intellect. As befits the granddaughter of the novelist Madame de Stael, she wrote memoirs, novels and biographies, including a study of Byron. She is said to have known Chopin. Famous for portraying the elite of French society, Ingres nonetheless found portraiture a devilish business. “It can’t be done,’’ he once told one of his pupils. “It’s enough to make one weep.’’ Yet no one could guess his struggle from his skillful rendition. You can almost hear the silk rustle. He made more 60 preparatory sketches for the Countess before casting the portrait aside. Her travels and fourth pregnancy delayed further sittings. Only three years later, when she was 27 and he was 65, did he finish. As a friend confided to her, “Monsieur Ingres must be in love with you to have painted you this way.’’ Perhaps he was.